You might have come across Hedgespoken at a festival or two over the past few years. Rima Staines and Tom Hirons entertain and entrance with stories told from their travelling Summer home come stage. Tom is an exceptional weaver of tales and Rima is a fantastically talented artist (you might recognise her through her covers for albums by Telling The Bees). They have organised all of their books and artwork into one website where it is all available to buy at Hedgespoken Press. It is chock full of delightfully printed booklets of poetry and art alongside Rima’s magical prints. The site will also stock works by other selected authors. Rima and Tom’s life story is fascinating and uncompromising, whilst most of us dip into an ‘alternative’ lifestyle at festivals, this couple along with their young son live it to the full. In their own words they are ‘are big-dreamers, with far-reaching hopes’ but the determination to carry through on those dreams takes a huge amount of commitment, energy and work. They have spent the winter in a cottage on Dartmoor recouping and repairing the vehicle (a 1966 Bedford RL lorry), that is their home and performance space for much of the Summer. 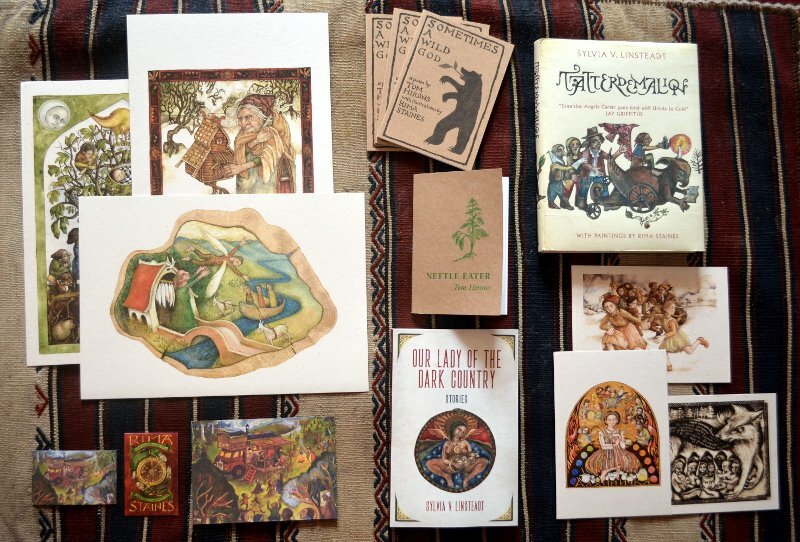 Their prints and publications have been organised into the Hedgespoken Press web shop, they have been working on new products and artwork and not least of all recharging batteries and planning for the coming months. So have a look at their new website and why not buy a little something that will bring a bit of their joyful magic into your home – They keep this all going through selling their products plus some donations to keep Hedgespoken rolling along the edge of the hedge. If you have been entertained by their stories you will understand their magic.